SURREY, BC – On June 26th, Russell Brewing celebrated the 17th anniversary of its first keg sale, and a new limited edition brew has been released to mark the occasion. 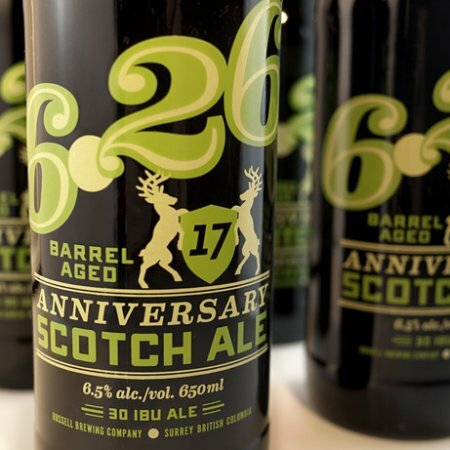 Russell Brewing Company celebrates its 17th Anniversary with a limited edition barrel aged Scotch Ale. This strong, dark ale was brewed with Scottish specialty peated malts for a slightly smoky character then skillfully aged in Bourbon barrels. A special Anniversary Ale crafted by our team of brewers to thank everyone for enjoying our unique beers throughout the years. 6.26 Anniversary Ale is limited to 280 cases – or 3360 x 650 ml bottles – available at select private liquor stores in British Columbia.